Here is the Leaderboard. All three of our cashers from this week are also in the Top 3 for the year. The Top 4 for the year are seperated by a total of $40, so anyone of the four could take the lead any week as long as we get 9+ players. Next Tuesday is Limit H.O.R.S.E. Hope to see you there! Back from my vacation so I could spend my 40th Birthday NOT having someone throw a surprise birthday party. Ready to play some poker tonight. Hope you all make it out for a little Pot Limit Omaha. heffmike took his 4th Skillz Game win, and jumped ahead of everyone on the leaderboard for 2009. Congratulations to heffmike, can he keep it up, or will others catch him by the end of the year? And with this posting, I am on VACATION!! 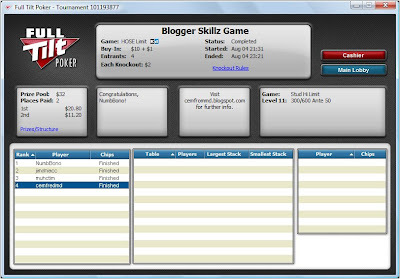 I will be back late next Monday, so I will still be here for next week's Skillz Game, while is Pot Limit Omaha Hi only. Limit Stud Hi/Low tonight. I will be there, hope many of you can make it too! Skillz Game rebounded well this week with 16 people showing up to play some Razz. Below is the Skillz Game 2009 Money Leaderboard. Lightning is a close 4th place now for the year, with Top 4 being very close (one tournament cash really) from jumping ahead of each other. Should be a fun last 4 months of the year on the leaderboard. I had a very nice run last night, playing good poker in both Pot Limit Hold'em and Pot Limit Omaha to get onto the final table, then taking the advice of many blogs I have read about the importance of restealing. This was especailly true when I made it to heads up, when I was at a 8:1 chip disadvantaget to start, but at one point actually took a 2:1 chip lead before getting rivered a few times late to eventually lose. But I will take a 2nd place in a 100+ person tournament, it has been a while. Played in a pair of Turbo Live tournament on Friday night, $20 buy-in, 5,000 chips, 10 minute levels. Took 2nd in the first one, when I was all in on the big blind (blinds were 16,000/32,000) and there were only 95,000 chips in play total. Actually pulled off the win in the second one, as we chopped the 1st/2ns place money with blinds still at 8,000/16,000 and the chips almost dead even, and then played it out (it lasted one hand). I will be there tonight, but hopefully will also be able to satellite into the FTOPS Turbo 6-Handed No-Limit tournament also, which the satellite is at 6:30 pm EDT tonight, so if you are on then come and watch/rail me if you would like. See you all tonight at Skillz Game. Only 4 players last night, but all of us got into a 7-Game Cash game also, which was a lot of fun. Next week is Limit Razz. Hope to see you all there. Skillz Game Tonight - Limit H.O.S.E. Limit H.O.S.E. tonight, and for Lightning, it will be followed my Razz next week.